To spread the news about the upcoming lecture, a few non-initiate children were drafted to use as forerunners. Sister Huang Youlah, a member of the work team described the story. "In Montreal, French is the official language and is most commonly used, but the newly immigrated fellow initiates could not speak French. In addition, most of the work team members could barely communicate in English. Luckily, these new immigrants had a few ten-year-old children who could speak a little French. We then counted on them to lead the way and translate for us. These little saints delightedly led us as we took the subways and transferred from one to another. They worked from seven in the morning until nightfall. 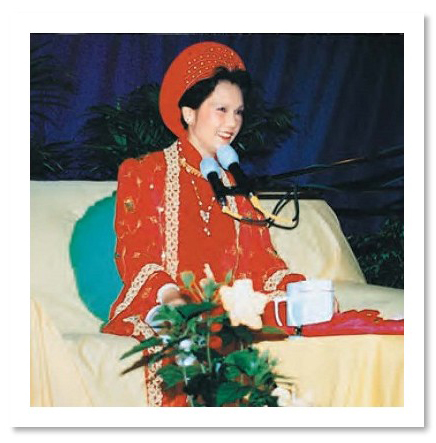 With their lovely smiles and French language skills, they introduced Master Ching Hai and Her teachings to the people around the city. Although the weather in Montreal was very cold, these little saints served as vehicles to transmit Master's message and love, which warmed up the city. Brother Chuang Hongda related another story. "A grandfather who had come from far away to visit his family also joined the work team, standing for a whole day distributing leaflets to people." Later this elderly gentleman, who was "over the age for initiation" and several children who were "underage" were initiated as exceptions. The good fortune to be initiated although they were technically ineligible was "earned" by them through their selfless efforts. Sister Wang, who came to Canada to go to college, cherished her good fortune of participating in the preparations for the lecture. Her work on behalf of Master's tour drew her closer to the Truth and paved her path to a bright future. She wrote: "We all filled up the house of a fellow initiate at night. We slept on the floor shoulder to shoulder. A Quan Yin messenger who slept beside me was full of vitality. She was always the first to get up in the morning. When I was enjoying my breakfast, a call of "Let's go!" always reminded me that a fast pace was what I had to learn. Once I heard the Quan Yin messenger say: "In a drought everywhere are found thirsty souls." I realized that her great willpower and racing pace in sharing the Truth with others came from her awareness of a universal connection between every soul. Her devotion also made her ignore and transcend the limitations of her physical condition. Every one of us was moved by her selflessness."